This has been, for some time, the least expensive stereo chorus stompbox you could buy here in Italy (and I’d bet that the same was true in a lot of other countries, too:) ). 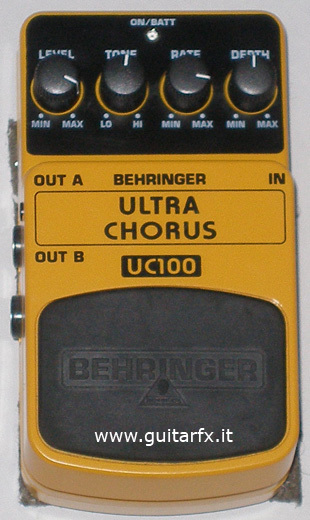 Right now, the UC100 is not present anymore in Behringer price list, and I think the UC-200 may have replaced it. I’m a little uncomfortable talking about this effect: the reason is that it does what is supposed to, it is unbelievably inxepensive, and the sound is not as good as the other chorus pedals I’ve tested, it isn’t really bad either. However, this last point is subject to debate, since the price of the other units I’m talking about is *5* (yes, five) times higher… so, I’m not sure I can make a fair comparison. Guitar players can spend impressive amounts of money to get the sound they want: for guitar stompboxes you usually have to pay a lot to get good stuff (sometimes you can spend a lot and get burned, anyway). For this reason, I will not talk further about the sound: however the construction is far from other more expensive products. The box is made of plastic, and considering the general structure, I wouldn’t kick around this unit on a stage. One thing I simply don’t like is the DC input on the right side, near the signal input: I’d have preferred DC input on top of the unit. Another thing I’m not exactly happy about is the battery compartment: to replace the 9V battery you have to “press the hinges with a ballpen and remove the pedal cover”. Owww…. and the author of the manual adds “Be careful not to scratch the pedal”. Very funny. In the photo, you can notice some velcro-like stuff glued on the bottom of the box by the owner. This unit has been sold from 1985 to 1989: it’s not really easy to get one, however you can still find them around, but usually not at a bargain price. It’s an analog chorus with 4 presets, and stereo output: this means you simply can’t tweak the sound, but the presets are good in my opinion, perfect for acoustic guitar, just don’t expect anything too extreme. Inside you’ll find 2 NE570N companders (probably used for noise reduction), 2 MN3207 1024-stages BBDs and 2 MN3102 chips. 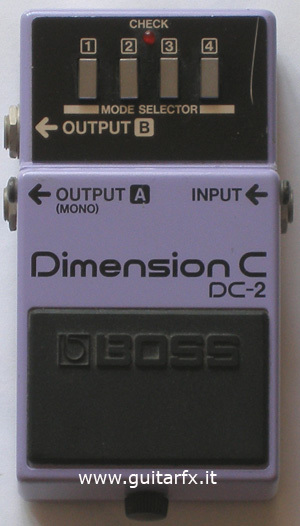 This is the first Boss “compact” chorus pedal, because its predecessor (the CE-1) used a much larger gray box. Settings are straightforward: “Rate” for speed and “Depth” for effect level. 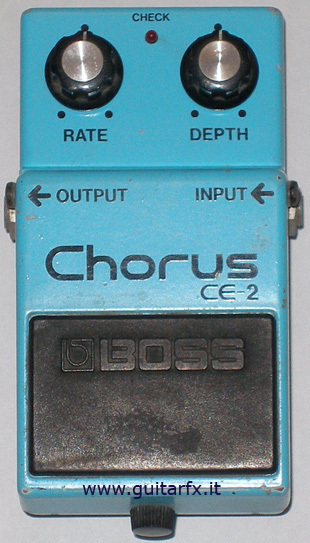 Sound is somewhat a classic, and lots of people prefers this to later models from the same manifacturer like the CE-3, CH-1 or CH-5, and even to any other chorus around. There are different versions of the circuit, all of them using the MN3007 BBD chip. Moreover, there are both Japan-made and Taiwan-made effects: while some people says that the Japanese one sounds better, I must say that I’ve tried them both and couldn’t find any relevant difference in listening.